This month marks the two year point from when I was able to start staying home with my little ones and really begin to start honing my homemaking skills. The past two years have been magical, challenging, and as all new adventures are….educational. One of my greatest feats I have been able to tackle has been putting food by for my family for those cooler months when food is not as abundant, or doesn’t come up at all. Now, I word this as a feat because I was always so intimidated by the entire idea of food preservation. I felt like there was so much research to be done, classes to be taken, and all of this was daunting because that meant time, time, time. However, now that I have done the research, I have come to realize that putting food by does not have to be alarming at all. And in all honesty, it doesn’t have to take up much time either. My biggest source of information when it comes to food preservation has been talking with farmers and other shoppers at the local farmer’s markets. You can learn a lot talking to the nona who has been canning tomato sauce for 50 years, or the farmer who has been freezing their strawberries for as long as they have been growing them. And the great part about these conversations is that they don’t take any more than a few minutes, and then you can be on your way, ready to begin your preservation journey. 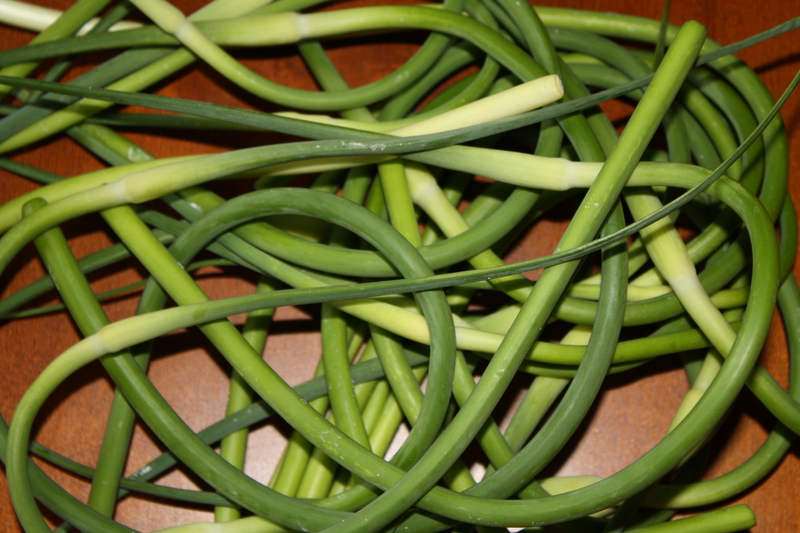 Yesterday I had one of these fabulous conversations with a local farmer who was selling garlic scapes. 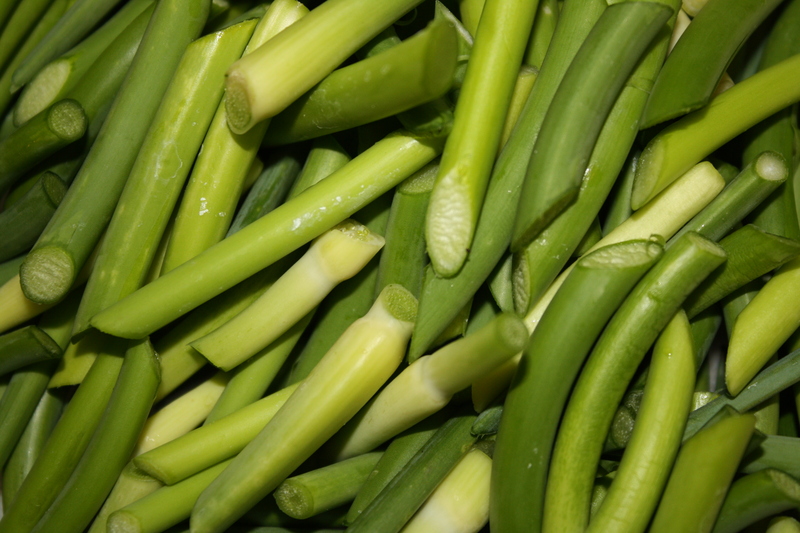 Garlic scapes are the green off shoots that emerge from the soil when growing hardneck Rocombole garlic. It looks much like a green onion, but a bit thinner and curly. 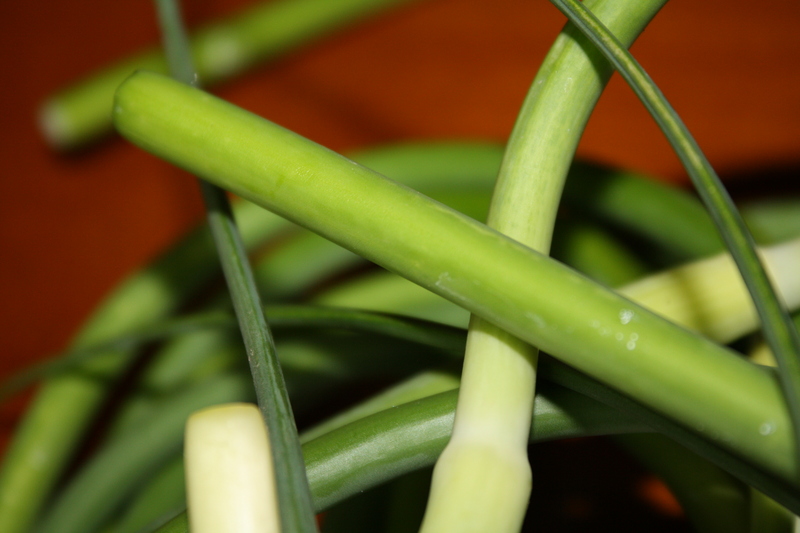 The farmer told me that you can prepare garlic scapes as you would green onions, but it obviously adds a lovely garlic taste to the dish instead of an oniony one. The farmer then proceeded to tell me they freeze beautifully. This made my ears perk up because I’m always in the market for food I can put by for another day. She told me to simply rise off the scopes and cut them into one to two inch sections. Then you simply place the pieces in a small zip lock freezer bag and freeze. She told me she will pull a few chunks out if she is making chilli or soup in the winter time and she just throws them in the pot frozen and they cook up nicely and give the dish delicious spicy flavor. This entry was posted in DIY, Gardening, Holistic Living, Putting Food By, Sustainable Living and tagged canning, DIY, eco friendly, farmer, farmer's market, food, food preservation, freezing, garden, gardening, gardens, garlic, garlic scopes, growing, harvest, holistic, holistic living, home, homemade, homemaker, homemaking, make, making, mama, mindfulness, mom, mother, organic, preservation, putting food by, sustainable, sustainable living. Bookmark the permalink. Never heard of them before! Thanks for the info!